I have a black german shepherd who was a white patch of fur on his chest. He has a sable under coat that shows through the black but only on certain parts of his body. It isn't brindle or stripe patterned though. Is this something that happens with purebred GSDs? 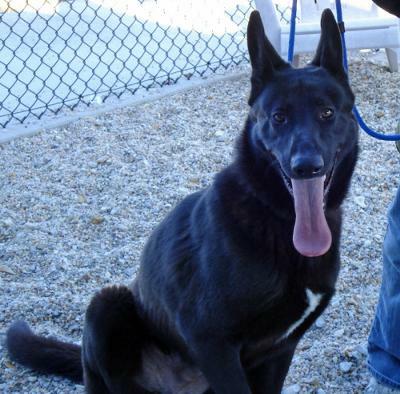 Comments for Black German Shepherd with odd markings. I would assume black but you could always check with the registry service you use (Akc, CKC, etc) first to find out exactly what they would suggest you choose. DDR or American bred GSD? I have a 4 month old boy pup that has the same markings.I was wondering if the ddr, east germany shepherds have more of a tendency to be all black in comparison to the american bread of the GSD,and also what if any differences do solid black shepherds have from tan/black,or red/black ones? Such white markings are actually common in GSDs, usually appearing on the chest, toes, and sometimes even the tail tip. These markings usually get smaller and less obvious as a puppy grows up, and become less noticeable. However in a dark bicolor or a solid black dog, these markings are very obvious because of their contrast against the black.